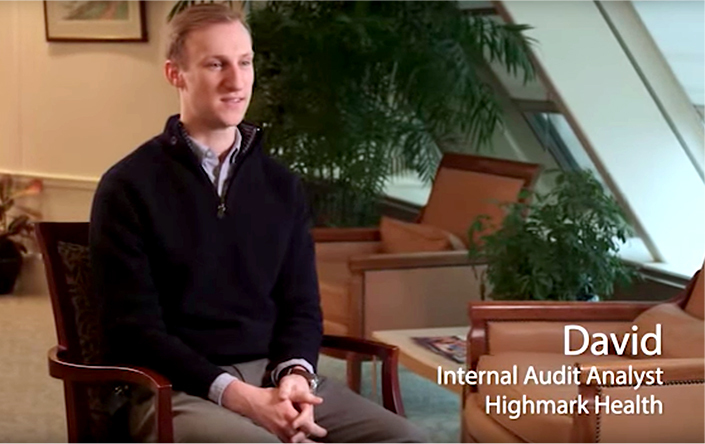 DAVID: I would recommend someone work for Highmark Health because there’s plenty of opportunities here. You’ll never be bored. BILL: One of the things that my boss said to me was, if you are looking for a job where you’re going to get a list of five things to do every day, this is not the job for you. But if you are looking to be abstract, so to speak, you’re looking to grow into your own space, to build your own value to the organization, then this is the absolute ideal job for you. KRISSY: It’s really important to be able to talk to people and listen to them. So it’s important for us to work together. AARON THROUGH INTERPRETER: You need to have a positive attitude, because when you come to work you never know what’s going to happen. It’s not the same every day. JENNIFER: To be successful here I think you need to know that the customer’s always at the center of what we do. But to know that change is going to be an everyday event, and have to be willing to change. ALEX: The whole health care industry is changing, and so we’ve got to be able to adapt to those changes. And Highmark Health is in the process of making that happen. SHAYNE: I think putting passion into what we do and remembering that at the end of the day we’re here to service our members. We’re not building widgets, we’re not creating cars, we’re not making video games. We’re doing something that matters and that touches people’s lives on a daily basis. SPEAKER: We are the heartbeat of health care.